NB I must preface this by stating you should always follow manufacturers instructions for caring and cleaning your mat. I am no expert. Notice the warping at the top, ironed on it by accident I think - whatever, just DON'T ever put hot stuff on your mat ok?! After asking advice a couple of weeks ago people gave me some good ideas for how to tackle cleaning it, thanks to everyone that left a comment! And special thanks to Agnes, Corrie H. and Carla who gave directions and a link to this tutorial. So I did as recommended and stuck it in a cool bath with some white vinegar, then scrubbed it with a little washing up liquid. Then Catrin (I think it was you! Correct me if I'm wrong?!) mentioned that you could use the end of a frixion pen to rub the mat and remove all the little pieces. Well wouldn't you know that works perfectly! But my mat is big and I was not about to attempt to rub the tiny end of this pen all over it. Nicky suggested a rubber glove, which I'm sure would work too but I hate them so instead I grabbed one of my kids trainers (sneakers if you prefer) that has a rubber sole and scrubbed it with that. That worked too! So I suggest getting something fairly large, made of rubber and get to work! That is the fluff I got off, the bottom one with the pen and the top one with the shoe! Still sad and I probably really need a new one but until that time this is a lot better!! - wiping it down after using it and using the rubbing method if there's lots of bits! 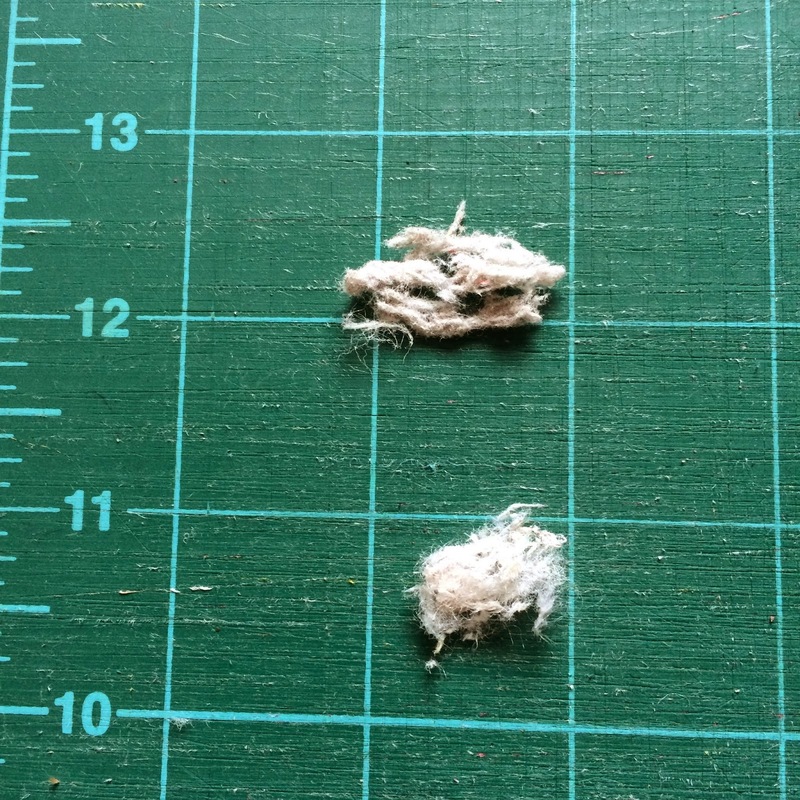 - and definitely rubbing it after cutting wadding, that seems to be the main culprit. Batting really does a number on the mats. I have a mat I use just for squaring up my quilts so that my main (and slightly larger) cutting mat will hopefully have an extended life. Great idea about using the rubber sole of a shoe, I'll try to file that away in my memory bank! Yep, that's me! Although credit should really go to Sarah (wobblyfrog on Instagram). I have to shout at my husband as he keeps on putting his coffee cups on my mats! I try not to cut batting on my good mat - or I use the cm side. I rub mine with a big blob of blutac to get the fluff out. Great post - will try a bath too! I have never soaked my mats, but know I really should! I do try and clean it often...I hate batting stuck in it! One other thing that helps save your mat life...if you aren't cutting something that needs to be square (such as improv/curves) turn your mat over and use the back. Batting and fabric fibers usually stick to my May when I don't use a sharp rotary cutting blade. About the hot stuff. I had relatives come for an overnight stay and they used it as an ironing board while I was asleep.. I didn't know it until after they left. Now my sup large cutting mat is all warped and ruined. Looks better! Who knew that a sneaker would come in so handy in cleaning the mat! Looks great, thanks for the follow up, so we all know what works! Can't blame you for not liking the rubbber glove - great solution ! I have a dog massage brush with rubber teeth - wonder if that would work!? Who knew, clever tip, thank you!! Happy I'm not the only one to iron my mat! i had read somewhere to soak them, but i didnt know anyone who'd tried.., thanks for testing it! Interesting! I swear years ago I saw a conditioner for mats, but I can't find any information about such a thing. Its a great idea to have a conditioner - maybe I dreamed it! When you mentioned trainer I thought you were talking about underwear! hahaha! The kind between diaper and real grown-up undies! LOL! I have several mats in different sizes so I change them up and that seems to save on the wear and tear. I really don't like when they get those grooves! It looks so much better!! That poor mat!!! It looks a lot better for a clean, though - I might give mine a soak in the bath, if it'll fit in without too much curling. P.S. 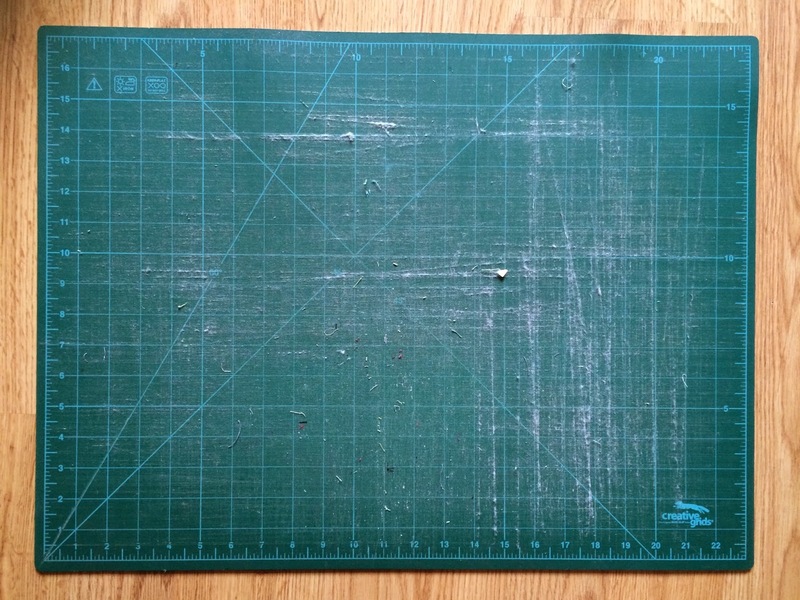 If you get a new mat, keep the old one for cutting wadding on! 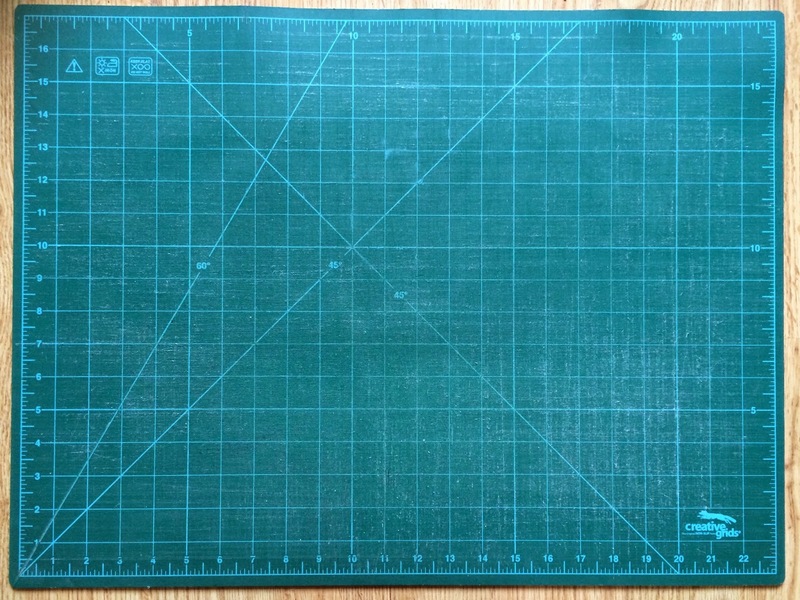 Or, if you only tend to use one side of the mat, use the 'wrong' side for wadding and make the old mat into templates. 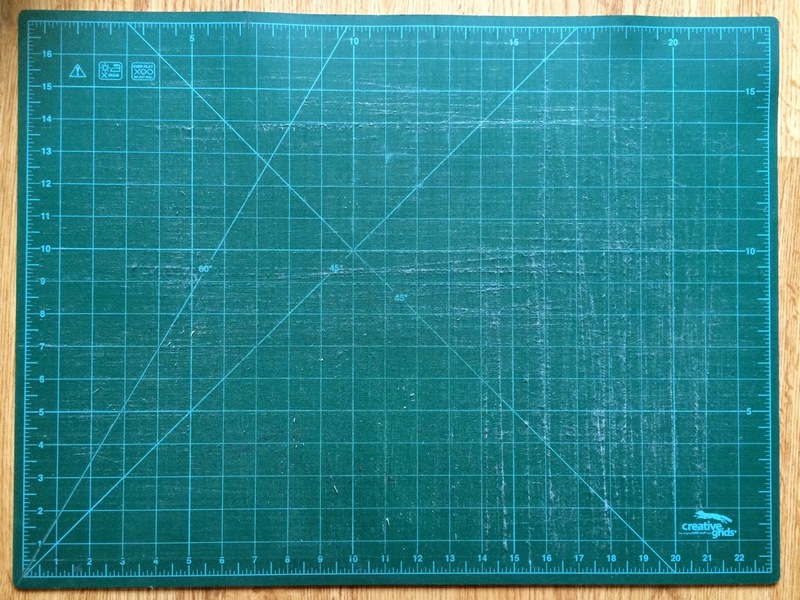 Have made the same mistake and cut batting on my newly purchased large cutting mat- a few times- doh! Not only it leaves a deeper cut because of the extra pressure you apply when cutting the batting but also lots of fluff inside the cuts. So annoying. What I do is that I get a damp clots and wrap it around my index and middle finger and run over the cuts. The dampness of the cloth picks up the fluff quite effectively. Thanks very much for sharing your cleaning tip with us! Was wondering what the heck to do with my sorry mat - cheers!